Coming into this rotation I thought I knew what I was getting myself into having visited back in July and doing my previous rotation at a different Health Partners that was a little different but had a similar idea. Helping those who don’t have insurance, or their insurance is failing to provide them with either the best care or any care at all. Having worked in a retail pharmacy for close to three years I know that I am a people person even when they are yelling and screaming at you. However, this rotation allowed me to dive farther into interacting with patients on a brand-new level. At first it was awkward trying to find my footing in this new dynamic but the ability to relate to and build relationships with people came through and really helped me. At Cedarville they really strive for students to have a servant’s heart, but I don’t think that is something that you can teach. This rotation is truly a wonderful opportunity for those who want to help those less fortunate than they are. Every person that works at Health Partners Free Clinic has a servant heart and would walk to the ends of the earth to help their patients. That is something that is really hard to find and there is a whole clinic full of them in Troy. The one thing I never want to stop doing is serving those around me, if I have the ability and tools to help people why not do it. I would have nothing if I kept that ability and those tools to myself. Welcoming each and every person with open arms no matter what their background is a very important component of helping to heal patients. That reminds me of the couple that we met at the first soup kitchen health screening we did this month. They could afford the monthly rent payments but the little extra that was required upfront was out of their budget so they were living in their car and that weekend coming up was supposed to be very cold so after we left the soup kitchen my preceptor called around to all the social work services in the area to find a solution, even if it was short term, to get these people off the street. Now being in a shelter they can save some money by not paying for gas so often that eventually they will be able to get a place to live. On top of that the guy was having very severe dental pain from rotting teeth and was constantly going to the ED to get some relief. But coming into the ED constantly in pain you are flagged as a drug seeker which worries me that he wasn’t getting the best care he could have. But my preceptor made some calls and got him appointments to get his teeth pulled and new dentures which is awesome that he won’t have to live with dental pain anymore. Another awesome part of this rotation was making a very special connection with one of the doctors. When he was in the peace corp he lived in Honduras for a few years and I was in Honduras last summer for a mission trip. We had a great conversion about our time there and exchanged stories. A few days later he brought in some pictures he found from his time there and a bowl to give to me that he bought while he was there. It was a very thoughtful gesture even though I know he was trying to downsize since he is moving across the country, it’s still the thought that counts. Overall it was a great experience that I would do again in a heartbeat. I learned a lot about myself and those around me. I think an experience like this should be a requirement for every pharmacy student just to show them there is a great need for helping the underserved population and honestly to humble them. I think sometimes get too focused on the money and not the patients that are serving. Reflecting over the past month one quote comes to mind, “it takes a village to raise a child”, but after my experiences I would like to continue that saying to include “and a community to care for a person.” During my time at Health partners Free Clinic, I was able to see the impact a healthcare team can have on a patient by working together. This unique clinic setting is able to provide individualized care to patients here in Miami County free of charge. Healthcare is an essential part of people’s lives and lack of access to healthcare is impacting counties right here in Ohio. Even though one may not have insurance or supplies they need, there are many different resources right here in the community that are ready to help and build someone back up. Spending time at local soup kitchens enabled us to reach out to those in need. Some patients were familiar faces, while others did not know the services the clinic could provide, but either way HPFC was able to reach a hand out to those in need. This past month at Health Partners allowed me to work as part of a healthcare team with doctors, nurse practitioners, nurses, pharmacists, and social workers to provide the best care possible. When taking care of patients’, it can be difficult to provide the care they need because it is outside the providers scope of practice. However, working with multiple other professions gave me the opportunity to treat the patient as a whole. If I wasn’t able to meet the patient’s needs, I knew someone at the clinic would be able to point them in the right direction and offer the help they needed. 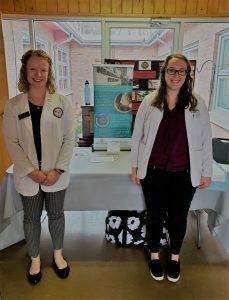 Not only was I given the opportunity to counsel patients on medications and disease states, but I was also able to reach out to resources relating to food, housing, and much more. The community resources I learned about will be something I continue to use, no matter where I am. Spending the past month at Health Partners has expanded my ability to provide patient care. The quality of care a person receives is key to them living their best possible life. When it comes to treating patients, you have to be flexible as a healthcare provider. Your number one priority may not be the patient’s, and during those situations you have to be able to take a step back and see the situation through the patient’s eyes. This month taught me how to be empathetic, compassionate, and understanding. I learned how one small act can make a huge difference. Whether it was supplying access to a medication, treatment, or being someone to talk to, it was rewarding to know the difference we were making in someone’s life. The experience I gained this month reminded me why I decided to pursue a career in pharmacy, to make a positive, impactful difference in people’s lives.